Sports games should always be an easy sell: the task of the developers working on such games is simply to provide a workable implementation of an already well-known set of rules to fit around the limitations of any input devices that may be at one’s disposal in the course of playing games. For the most part, this results in games with similar mechanics but different approaches to their realisation and resultant game that “feels” different because of this (compare FIFA to Pro Evolution Soccer; NHL [YEAR] to NHL 2K[n]). Every now and then, however, such as with Libero Grande’s single-player-control approach for football, games are created from the source sport that have somewhat of a genre-breaking element to them. 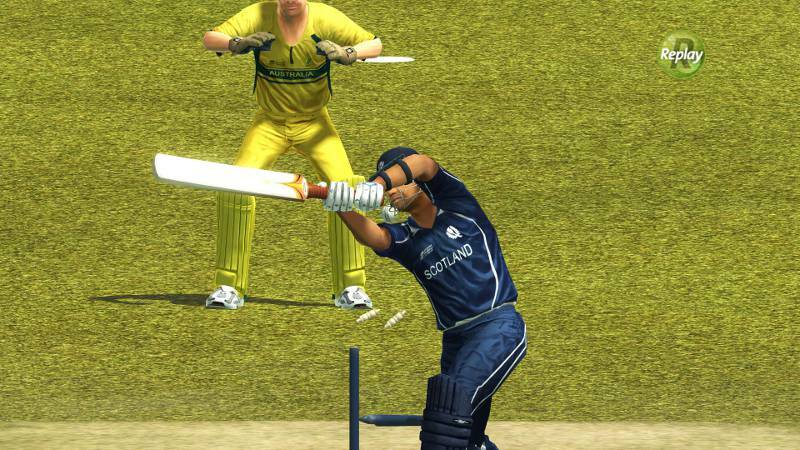 The Brian Lara series of cricket games is not of this particularly innovative ilk: it is a genre cricket simulation game. What is particularly interesting is that approach that cricket games have taken to realising the premise of cricket in a videogame context. Brian Lara‘s treatment of temporal phenomena is a departure from traditional approaches to sports games. The traditional approach is that the sport is adapted in a real-time manner: to take an example from “conventional” football games, the player can nominate a player to control on the fly in an attempt to either evade or regain control of the ball from an opposition player, be they flesh-and-blood or game AI, who also has the same abilities to move in real time. This mechanism of control places the traditional sport adaptation game squarely into the realms of the games of the traditional “action genre.” The approach taken by the Brian Lara series, however, is to divorce treatment of bowling and battling activities in temporal terms, which serves to create a multifaceted, multi-layered series of metagames. The divorce of bowling and batting actions into separate, time-boxed call-and-response type activities is a necessary corollary of how the sport itself operates: one can’t act to strike a ball that is yet to be issued to the batsman. 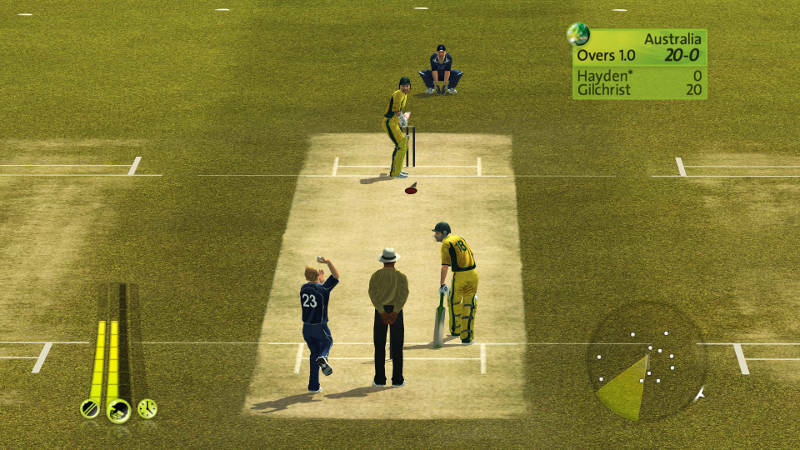 The way in which the Brian Lara games have, to use a terrible term, “gamified” on-pitch interactions from cricket is delightfully simple, but presents something unique in sports games, while it may be expected from more narrative-driven experiences: the mechanics of both bowling and battling punish miscalculations in the same way that a turn-based strategy game or SRPG would. While awaiting delivery of the ball, the batting player is able to position their batsman where they deem appropriate given the indicated trajectory of the ball – failure to account for the myriad delivery types that may cause the ball’s trajectory to change may lead to sub-optimal outcomes: this leads to the organic genesis of a metagame around either knowing the flesh-and-blood bowling player’s preferences, or coming to understand an initially erratic-seeming AI. A similar sense of commitment exists for the bowling player in that the initial selection of ball trajectory is fairly binding on the end result – the ball can be made to move in the air, but only by a fairly marginal amount: this creates a further metagame centred around exploitation of this limited post-commitment movement to best effect, where the best effect of this movement is heavily contingent on how the batting player is expected to react. This bowling metagame has become less challenging throughout the game’s iterations, particularly with the inertia of the bowling reticule being removed, but the challenge is still very much there: after bowling a series of off-breaks, a flipper may be enough to confuse one’s opponent. Very few game video game experiences are as satisfying as knowing that one has really outsmarted a batsman in Brian Lara. The early mention of Libero Grande here is somewhat telling about the trouble that sports games face: as soon as the movement is made away from one-on-one, or one-on-many, adversarial relationships between players and more of the player’s interaction of the game is determined by AI (such as the control of teammates in FIFA), there is less scope for intelligent play; less scope for human, emotional factors to become pivotal in determining outcomes of games. Having said that the traditional stable of sports simulation games seem to follow action game tropes, it seems worthwhile to bring attention to that games in that genre can offer and reward the sort of strategic gameplay stated above: looking at any of Platinum’s output or at Resident Evil 4 shows incredibly deep systems within action-heavy games. The sense of urgency and immediacy that precludes such mechanics appears to be a function of a lack of control over the pitch as a whole: taking complete control over a situation with one player character is something that cannot be paralleled by cooperation with an AI.